Seymour We Want is a not-for-profit group that formed after a Jesuit Social Services study identified Seymour as the 10th most disadvantaged in Victoria and NSW in 1999. 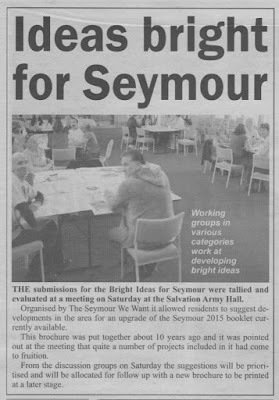 Over the past six months the group has invited residents to submit their 'Bright Ideas' for Seymour which have been collected and presented at a workshop with the plan of prioritising items for a new community plan. Of the nearly 600 'Bright Ideas' for Seymour I submitted about ten. 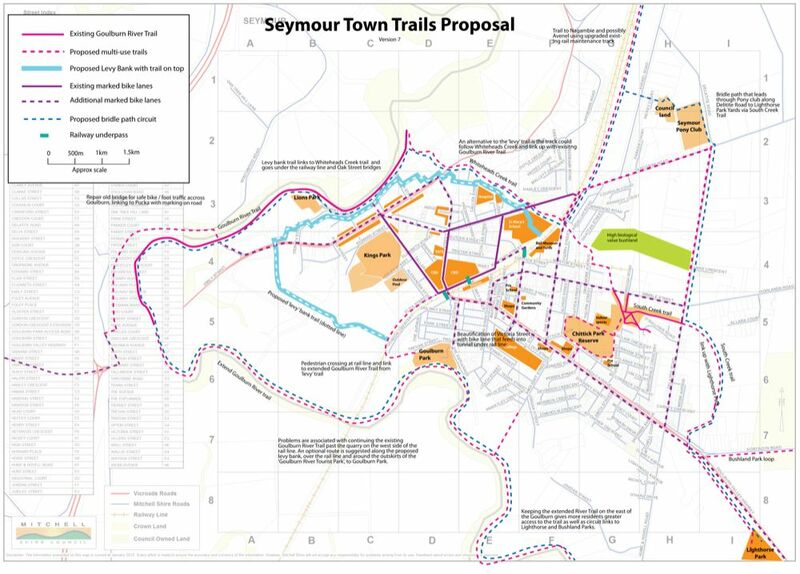 One of those being a network of trails for Seymour town and surrounds, which I worked up further into maps that I will also be submitting to council as part of the Mitchell Open Space and Off-road Recreational Trails Strategy. I presented these maps at the workshop for feedback from resident and to stimulate discussion about how trails might be incorporated into the town plan. The proposed trails indicated on the maps offer a large variety of methods for getting from A to B, and an alternative to fossil fuel based transit. They encourage exercise and provide for increasing biodiversity by allocating spaces that can be revegetated and used as wildlife corridoors. 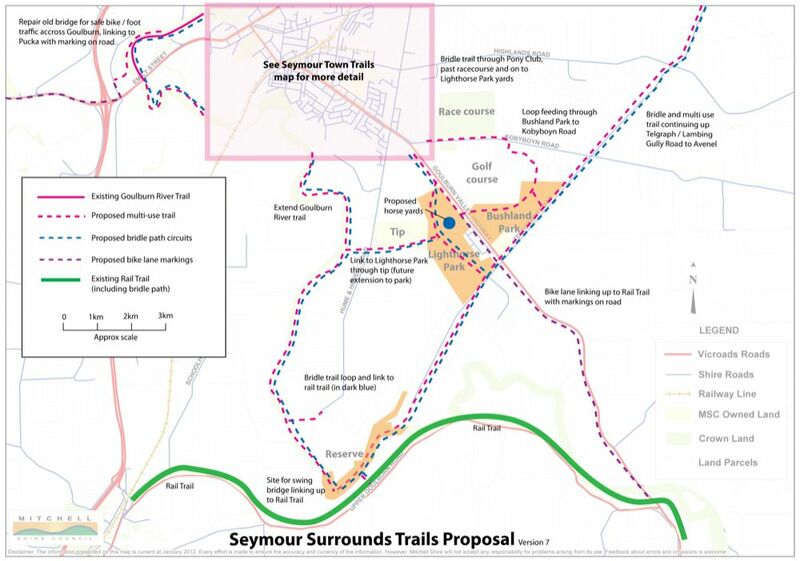 I envisage a network of footpaths and bike lanes that are linked to a circuit that runs around Seymour, which includes multi-use trails and bridle paths. The surrounding circuit offers the opportunity to incorporate wildlife corridors with suitable vegetation plantings to beautify and increase biodiversity. This approach provides non fossil-fuel dependant methods of transport for recreation / travel, improving health and well being as well as restoring our environment which will help address the twin issues of Peak Oil and Climate Change. There are tourism opportunities to make Seymour more resilient in adapting to these severe changes that lie ahead. The adoption of a trail network will beautify our township, enriching the lives of locals and attracting visitors (future residents?) to make use of these assets, adding further economic value to our town. The trails suggested pass through some of the most scenic parts of Seymour and it's surrounds, which are not currently accessible to the public at large. I have proposed a swing bridge over the Goulburn River, half way between Tallarook and Trawool at it's closest point to the Rail Trail. 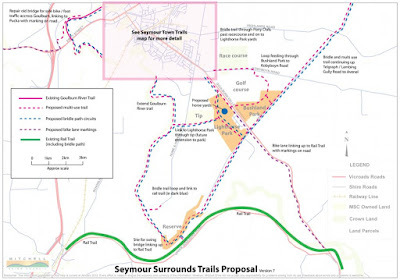 This allows the Goulburn River Trail to remain on the east side of the river which provides greater access to residents of Seymour whist giving a impressive link to Tallarook. It also links to some beautiful under-utilised public land at the end of Telegraph Road, the site of the proposed bridge. Footpaths, for foot traffic and wheeled transport (prams, wheelchairs, small electric transport etc). One of the problems with the footpaths around Seymour is that there are many areas where overgrown vegetation makes use difficult and sometimes dangerous to commute. There are also many places where paths end unexpectedly or require navigating up a curb which is very difficult with small wheeled transport. These issues could be addressed with minimal expenditure. Bike lanes, for human (and possibly small electric) powered transport with provision and markings on existing roads. There are some roads around the centre of Seymour that have been marked with bike lanes, most of which are unclear and worn off after years without maintenance. There needs to be a plan for networking these lanes for the town as a whole. The inclusion of a network of bike lanes would make riding around town a safer and more viable option for residents at little cost with possible links to Puckapunyal and the Rail Trail at Trawool. Multi-use trails, for pedestrians (including dogs on leads) and human powered transport. The Goulburn River Trail is one of Seymour's greatest natural assets and attractions. This should be extended to create a circuit and connect to the Rail Trail, linking up with the other main parks in and around town. This recreation trail will become a major attraction for tourists and provide an alternative for commuting in and around town for many locals. It could provide off-road links to Tallarook, Avenel and Nagambie. Bridle paths, for horse based travel. The prestigious Darley Seymour Cup at the Seymour Racecourse and Light Horse Park already cement our town as a historic horse centre. 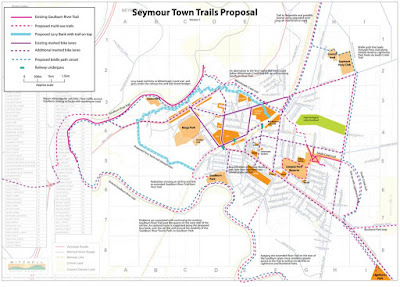 A network of trails around town, linking to Avenel and Nagambie (renown for its equine industry) in the north and the horse accessible rail trail in the south would be a wonderful way to attract people to use Seymour as a base to begin their travels. The proposed horse yards at Light Horse Park could well provide the base for this, supplemented by the pony club in the north east of town.